a superhero or two on the cover (in this case, a patriotic type called The Shield and a grim avenger named The Hangman), and a hodge-podge of humor, adventure and what-have-you in the back pages. In the 22nd issue (December, 1941), without fanfare, a teenage humor series about a carrot-topped kid and his pals 'n' gals at Riverdale High School made its first appearance, replacing a somewhat less wholesome feature titled Madam Satan. In #36 (February, 1943), they tried putting Archie on the Pep Comics cover, and within a year and a half, he'd squeezed the superheroes right off. In 1945, the publisher itself changed its name from MLJ to Archie Comics. 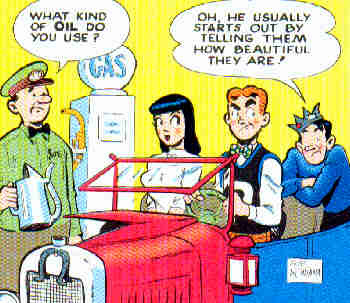 It was also about then that Archie supplanted Harold Teen as America's typical teenager. From there, he went on to become one of comics' greatest successes. The impetus for the creation of Archie was a thought on the part of John L. Goldwater (the "J" of MLJ Comics) that a character modeled after Mickey Rooney's film persona might be worth doing. For the idea of blatantly ripping off a bunch of movies, Goldwater is officially credited with the creation of the Riverdale melange — but the early stories that turned Goldwater's "idea" into characters with names and personalities were written by Vic Bloom and drawn by Bob Montana. In his initial outing, Archie's only supporting characters were his pal, Jughead Jones, and his girlfriend, Betty Cooper. The ultra-wealthy Veronica Lodge entered the picture four issues later, and arch-rival Reggie Mantle not long after. Since then, supporting characters have proliferated, to the point where they include dozens of friends, enemies, parents, school employees, neighborhood folks, and every other type of person likely to be part of a teenager's life. In 1947, Montana started writing and drawing Archie as a daily and Sunday newspaper comic strip. He continued to do the strip until his death, in 1975, whereupon it was taken over by Dan DeCarlo (Jetta of the 21st Century). Several writers and artists have since handled the strip. Another way DeCarlo replaced Montana was in designing the company's "house style" — that is, the distinctive way the characters are drawn, so that no matter who does the art, the reader can see at a glance that it's an Archie comic. When DeCarlo joined Archie Comics, in 1957, the company made his clean, clear cartooning style its standard — and even when, in May, 2000, they fired the 80-year-old cartoonist in a dispute over his rights as creator of Josie & the Pussycats, they continued using the house style he'd originated. Starting in the 1960s, the Life with Archie series experimented with adventure-story motifs. "The Man from R.I.V.E.R.D.A.L.E." placed him and his friends in the world of Bond-style high-living secret agents, and in "Pureheart the Powerful", they were cast as superheroes. The latter series, which included Jughead as Captain Hero, Betty as Superteen and Reggie as Evilheart, was awarded its own title in 1966. Archie As Pureheart the Powerful lasted six issues, and its second-order spin-off, Jughead as Captain Hero, ran seven. All of them, as well as the original Life with Archie appearances, are now considered high-grade collector's items. Archie was never a big star outside of comics, but he did support a bubble-gum rock band in the late 1960s. The Archies even had a #1 pop song, "Sugar Sugar", in 1969. He's also been seen in animated form, on Saturday morning television, sporadically since the 1960s — often in conjunction with Sabrina the Teenage Witch. A 1971 animated Archie show was also notable for featuring Broom-Hilda, Alley Oop, Smokey Stover and other comic strip characters in back-up segments. Other than these cartoons, Archie's only media exposure has been a 15-years-later, grown-up version, who appeared in Return to Riverdale, a 1990 made-for-TV movie. But he was licensed by another comic book company, Spire Christian Comics (Barney Bear), which for a time during the late 1970s and early '80s, produced a minor parallel series. From its inception, the MLJ/Archie line was a small company, controlled by its founders. Today, it is still controlled by its founders' heirs. Archie has changed clothing styles through the years, and nowadays he's as likely to have trouble with his computer as with his car — but he remains America's typical teenager. Text ©1999-2008 Donald D. Markstein. Art © Archie Comics.